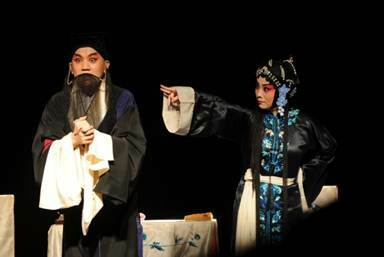 Asia Society has invited the Shanghai Kunqu Opera Troupe for two performances of “The Lanke Mountain”. This piece is not performed often. All the more reason to see it! The story follows the heroine, Cui, who divorces her husband and then attempts to reunite with him when he becomes financially successful. What a revolutionary-minded gal! Kunqu was developed during the late Yuan Dynasty (1279-1368), and is said to have evolved from theatrical forms that go back to the third century B.C. Kunqu’s emergence ushered in a golden age of Chinese drama in which it dominated Chinese theatre from the sixteenth to eighteenth centuries. Kunqu is known for its elegant performing style. In Kunqu, music, dance and acting are all integrated into a seamless and fluid performance. Most of the popular pieces in the Kungqu repertory are love stories. But The Lanke Mountain is a “moral tale featuring slapstick comedy,” which adds another incentive to see it.